It was an early morning for us, as early as waking up for work. The reason? 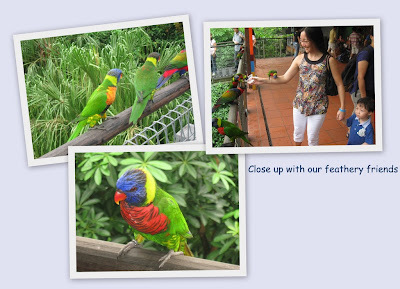 We're visiting the Jurong Bird Park, courtesy of GuGu's Family Day event. It's been ages since I've last visited the place. I only remembered the parrots, macaws & the cockcatoos that greeted us at the entrance. Now the JBP is very much spruced up. It's also Daddy's very first time at JBP. The slight drizzle made it a very cool morning. 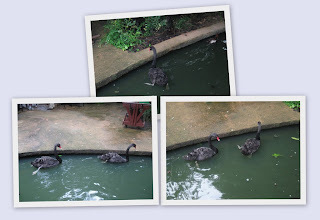 The 1st bird that greeted us at the entrance were these very beautiful black swans. The first enclosure we went to were the Penguins. Think it's Baby G's first real live encounter with penguins. 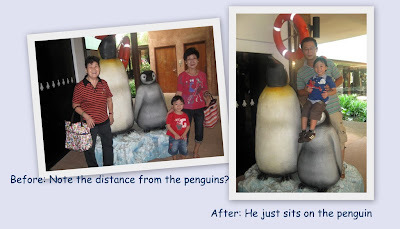 There were 2 huge penguin 'mannequins' at the entrance & Baby G was really afraid of it. He only agreed to take photos with it provided someone was with him. However, at the end of the entire trip, he actually was ok to sit on it. 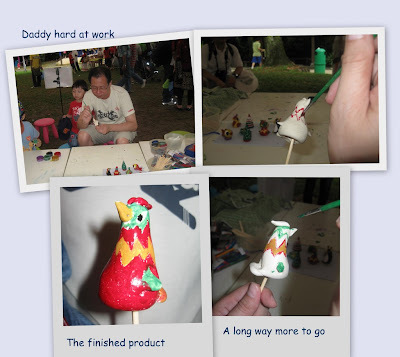 We first went to look for GuGu at her Family Day event, there were many game stalls there, but as usual, Baby G is always very scared of new environments. We thought that we could interest Baby G in some painting, but in the end, it was Daddy who ended up doing all the work while Baby G just watched. However, what Baby G was interested in was the wet area. Luckily I brought extra clothing for him. He enjoyed himself, but we only let him play for a while since the weather was still pretty cold. 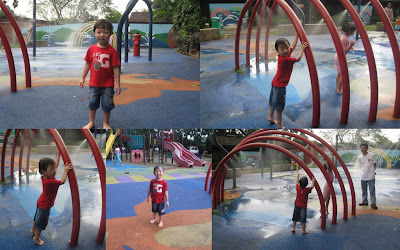 After the lunch, we started to explore the area more thoroughly. We even stopped by this area called Lory's Loft where I had a close encounter of the multi-coloured Lories. Their claws were really sharp & not to mention, they are really very greedy birds. One Lory even used his feet to kick another Lory away just to get at the food that I was feeding. What an experience! As always, Baby G always stood a safe distance away. ==> To GuGu, thanks for the treat!